Here is the second in this special series of Guest Posts here at The Book Chook. Read the first at A Book That Impacted My Life - Kelly Burstow. If you're interested in submitting an article about a children's book that has had an impact on your life, please use the Contact Me tab above. Today's article is from Virginia Lowe. 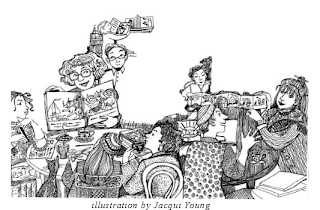 Virginia Lowe formed Create a Kids’ Book fifteen years ago, and has helped over forty titles to publication in that time. She holds workshops in Melbourne, and e-courses on writing the picture book or the novel. She also mentors, and sends out a free monthly bulletin on writing for kids and children’s literature generally. The website is www.createakidsbook.com.au. Before she started the business, she lectured in English and children’s literature, was a Judge for the CBCA Book of the Year Awards, and earlier was a school and municipal librarian. Coming from a very religious family, I encountered little fantasy – certainly no fairy tales – until I could read them for myself. So I soon voraciously raided the neighbours' shelves. Kipling’s Just So Stories, from the boys over the back, were among the first I met – I particularly remember 'How the alphabet was made', as it was about a little girl and I identified with her trying to communicate with her daddy without written words. And the jokey way that she invented and used each of the letters. 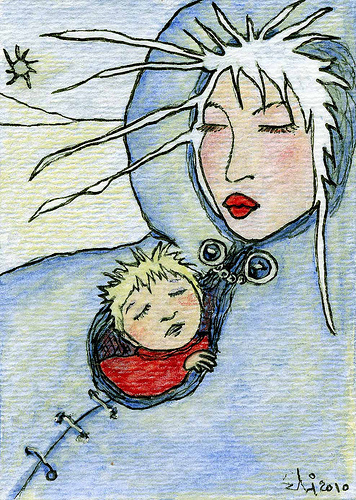 But perhaps the most significant was Hans Christian Andersen’s The Snow Queen, from Susan next door. I’ve no idea what edition it was, or who the illustrations were by, but the pictures have stayed in my mind. (Though probably with no relationship to how they really were. I recently had cause to return to another book of my childhood, of whose pictures I had very vivid memories – and it turned out that the mental picture was not like the actual one at all. So I don’t know, but here is what I remember). They were black and white sketches, and there were few of them. The book itself was one of the largish postwar books with thick paper – rather ugly. Similar to the annuals – ‘stories for girls’ type. I’m almost sure it was not abridged, because when I have read the story again subsequently, every incident seems familiar. Kai gets a splinter of glass in his eye and goes to the Snow Queen. I remember brave Gerda going off to rescue her friend, and some of the dramas along the way – the Robber Girl particularly. And the picture of Kai sitting among endless splinters of ice, trying to fit them together. But my strongest memory is the last words – in the translation on my shelves now, ‘There they sat the two of them, grownups; and yet in their hearts children, and it was summer; a warm glorious summer day.’ No, it didn’t go exactly like that, of course it was a different translation, but what impressed me was that they held hands and made their way home to their little rooms in the attic, and they were grown up. That seemed so significant to me, yet in abridged versions (for picture books especially) this is the fact that is left out. Maybe I don’t remember it so well, but I know it made a deep impression on me. The indescribable feeling of being taken to another, different, world. And a little girl just like me – Gerda – lived in it. And I could live in it too, for the length of the reading.